For years I’ve gone exploring wetlands in the same area. I always took my rubber boots as it was often covered with water four to six inches deep. My favorite time to go was when the rose mallow bloomed. Of course many other plants were there too: fringed loosestrife, sneezeweed, seedbox, wild bean, swamp milkweed, American bugleweed among others. Monarch, swallowtail, sulfur, pearl crescent butterflies fluttered from one milkweed to another. Bumblebees and wasps were checking out every flower. 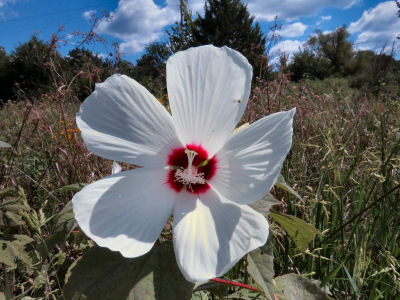 One of the largest, showiest flowers in the Ozarks is Rose Mallow. It likes sunny wetland areas that flood often and doesn’t mind standing water for periods of time. This year my wetland is gone. It was the victim of a greedy rancher and his herbicide. Grass does not grow in a wetland. Sedges do. Cattle do not like sedges. And liver flukes and lung worm larvae are common in wetlands. 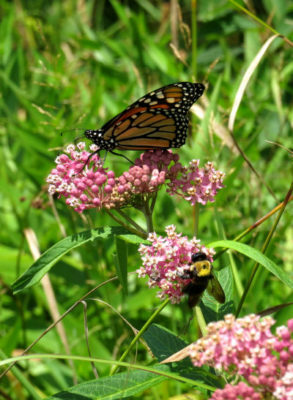 Declining populations of Monarch Butterflies have started a push to conserve wetlands as the three milkweeds most used for their caterpillars, common, purple and swamp, prefer to grow in wetland areas. I saw several of these impressive butterflies exploring this wetland. A friend told me about another place to go. So I went exploring wetlands in this new location. It’s nice enough. It has a different community of plants and insects. 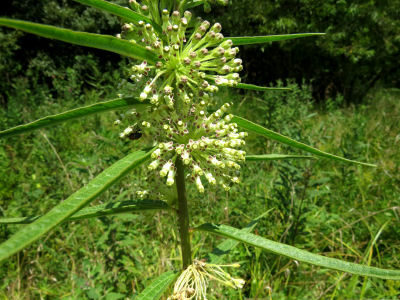 Tall Green Milkweed is more popular with beetles than butterflies. Monarch caterpillars will eat this milkweed but the leaves are smaller and further apart than the more popular swamp or common milkweeds. The swamp milkweed was there with its attendant Monarch butterflies. Tall green milkweed was blooming too. Common milkweed had seed pods on it. A lot of fog fruit grows in this area. I had seen only one other plant before and a flood carried it away. Now I have incentive to go back as the plants were in bloom, but had no seeds yet. Finding Fog Fruit was a pleasant surprise when exploring this new wetland area. 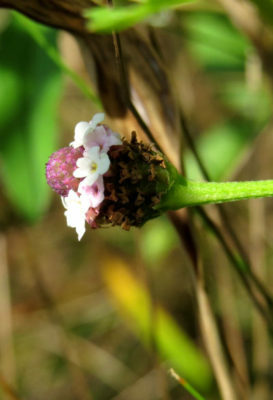 This member of the Verbena family has quarter inch flowers and makes itself showy by having rings of them. There were no fruits yet so I must go back. Maybe then I will see why this is a fog fruit. The fringed loosestrife sneezeweed and many other plants aren’t here. This area is a drier place than the other one. It may be safer than the other wetland as this one is in a powerline right of way. Part of it had been mowed, but the electric companies don’t use much herbicide anymore. Some people call clear wing hawkmoths by hummingbird moths because they hover around flowers sipping nectar. 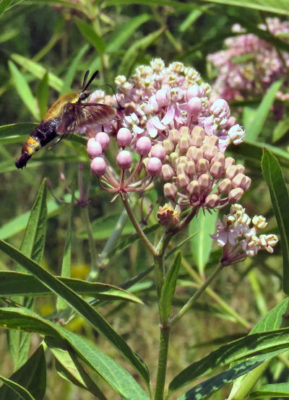 The moths are active during the day and find swamp milkweed, Asclepias incarnata, a great food source. A single rose mallow plant is blooming in my old wetland area. I think I will pack my boots and go exploring wetlands there to see if any of the other plants have survived. I still need seed pictures of several of the plants. This entry was posted in Ozark Hills and tagged clear wing hawkmoth, conserving wetlands, exploring wetlands, milkweeds and Monarchs on August 10, 2018 by [email protected].